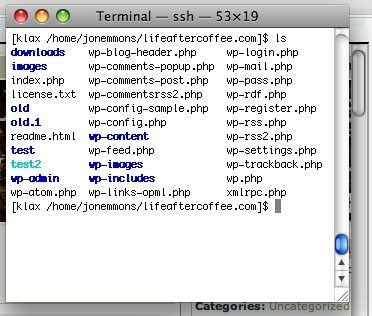 Many popular varieties of Linux use a “feature” which causes the ls command output to show files, directories, links, etc. all in different colors. I guess some people prefer this, but I find it at best annoying, and at worst illegible. Specifically the color-coding of symbolic links tend to show in such a light color that it is often impossible to read. The color output is accomplished by adding the --color=tty or a similar option to the ls command. This is typically accomplished by creating an alias to ls in either the user’s profile or in one of the system-wide profiles. This can either be added to the user’s configuration file (e.g. the .profile or .bash_profile in their home directory), or you can just type unalias ls anytime to disable color ls output for the rest of the current shell session. This can be especially useful to turn off the color output when you’re working on someone else’s system. Color-coded ls output can cause permissions errors in some circumstances, so in my opinion it is best left off, but if you’re stuck with it then it’s nice to know how it can be disabled when necessary. UNIX and Linux shells provide an abundance of useful built-in information that can be referenced in globally available variables. In order to see the information provided in a shell, the set command can be run as demonstrated below. The contents of a shell variable can be displayed by using the echo command and prefacing the variable name with a dollar sign as demonstrated below. Shell variables are referenced using all capital letters. There are also some special built-in variables that can be useful when creating shell scripts. Some of them are listed in the table below. $# The total number of arguments passed to a shell script on the command line. $* All arguments passed to the shell script. $0 The command (script) invoked on the command line. $1 – $9 The first through ninth arguments passed to the shell script from the command line. These variables are provided by the shell and the names should not be used for other variables.